Daula Hotel, the Kano State owned hotel built in 1974/5, was once one of the nicest hotels in Kano. You can see it in the lines, in the airy covered walkways lined with trees and flowering bushes. It is no longer. I took these photos exactly a month ago 13 January 2011, after a growing curiosity about the closed gates and the handwritten banner flapping outside I saw every time I passed. 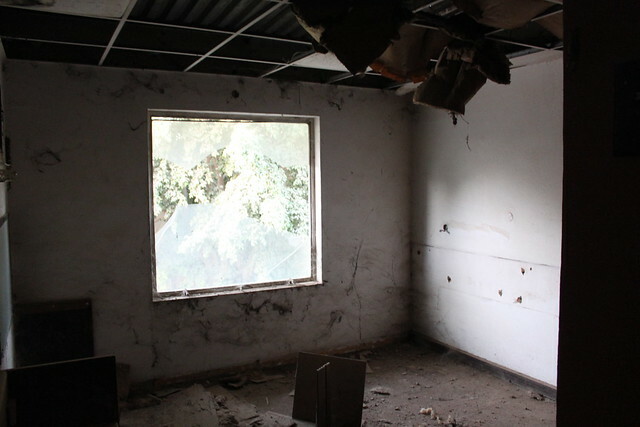 The hotel lies in ruins, as if in an abandoned city, after a war. Daula Hotel has 140 staff. The few that were standing around in the hotel compound when I visited told me that they had not been paid since October 2010. In addition, they said they haven’t been getting their annual leave, and for ten years haven’t recieved their NSITF trust fund or retirement benefits. The families of those who have died, they said, receive no pension. 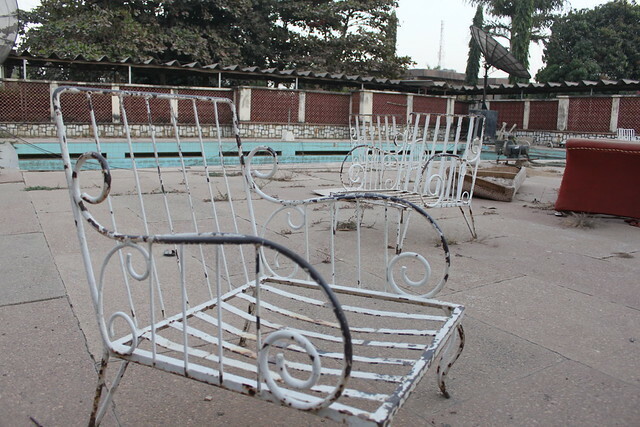 Weekly Trust findings show that since Daula Hotel, owned by the Kano state government was commissioned in 1975, there have been no major capital injection or rehabilitation work carried out apart from the cosmetic facelift given to the hotel in 1999 when Nigeria hosted the Under 17 World cup. Mismanagement by successive governments and appointed managers of the hotel, Weekly Trust learnt, also led to the present state the hotel found itself. According to Comrade Sadeeq Suleiman, branch chairman of the National Union of Hotel and Personal Services, the workers and the hotel are dying gradually. “To say that Daula Hotel has collapsed is an understatement as you have seen after going round the place. 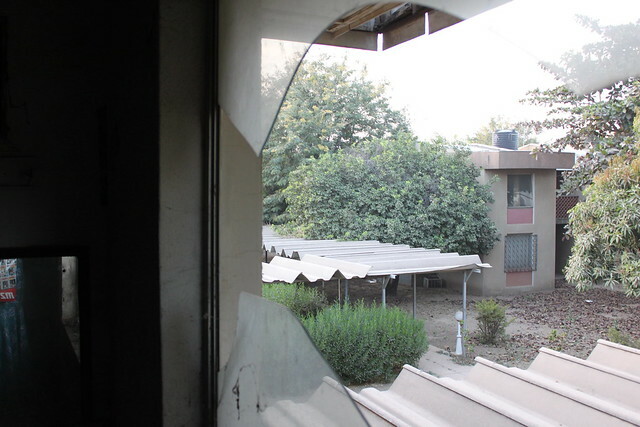 We think that there is a deliberate attempt by government to kill this hotel. If not, how can the Kano state government allow this hotel to decay while they have retainership in other hotels in town where they pay bills of nothing less than N350 million for accommodation, feeding and other sundry matters monthly? Yet when they send their guest here, they don’t pay. It will baffle you to know that it takes more than six months for the government to settle just N2 million they owe Daula. If they give us half the amount they spend in other hotels, we won’t be where we are today. They say we are a parastatal but they don’t treat us like a parastatal. Every month we have to go on strike before we can get our salaries. We don’t have service charge and above all, our pension contribution for 10 years was not remitted to the NSTIF. We are suffering. Those who retired have died without pension. We are hounded by landlords all the time and even children school fees are a problem”, he lamented. 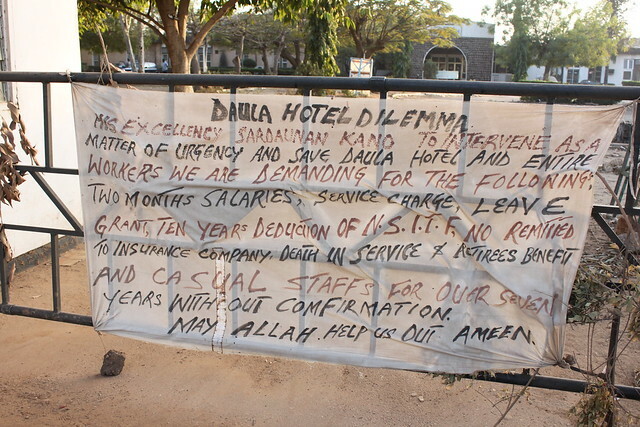 He said the Shekarau administration is the worst thing to happen to Daula Hotel. “Seven years ago, things were not this terrible. At least, we were still patching things. But today, we are at a standstill. Governor Ibrahim Shekarau came here two years ago and saw the condition of the place. He met everywhere leaking and promised to address the problem in two weeks. Up till now, we have not seen anything from him. We know that those in government have connived with other hotels in town where they inflate hotel bill to get their share. We are aware that if government bill is N5 million, they add another N5 million as their own share. I am a seasoned hotel administrator and I know what I am saying. What we are saying is that we are tired. If they don’t do something fast our frustration has gotten to a level where we can burn down this hotel. The cheating is too much,” he threatened. A source who prefers anonymity, told Weekly Trust that the government has retainership with Tahir Guest Palace, Hotel Horizon, Royal Tropicana, Kano Guest Inn, Niima Guest Palace, among others. None of these hotels, according to him, is up to Daula but yet government neglected the place and prefers spending millions with these hotels. He said if government can give Daula N50 million every year, it will save huge resources they are expending on hotels and Daula too will generate profit for the government. I delayed writing this blog post right away because they told me they hoped to be paid in the next few days. I did not want to post all these photos if they were about to be paid. Several told me that the governor had approved for them to be paid, but the ministry of commerce was delaying the payment. Today, when I visited Daula again, several asked me, “What happened to those photos? What happened to the piece you were going to write?” It has now been four months since they have been paid, three months since they’ve gone on strike. Striking staff took me around the hotel, through the lobby, footprints marked in the deep dust and then layered over again. 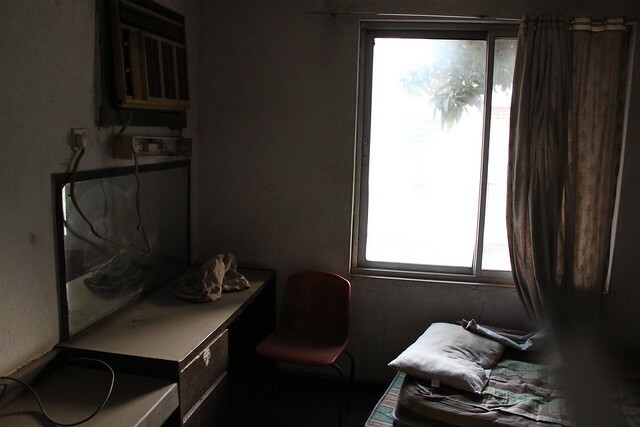 We walked through the overgrown gardens, and up the stairs into rooms where the doors hung off their hinges. 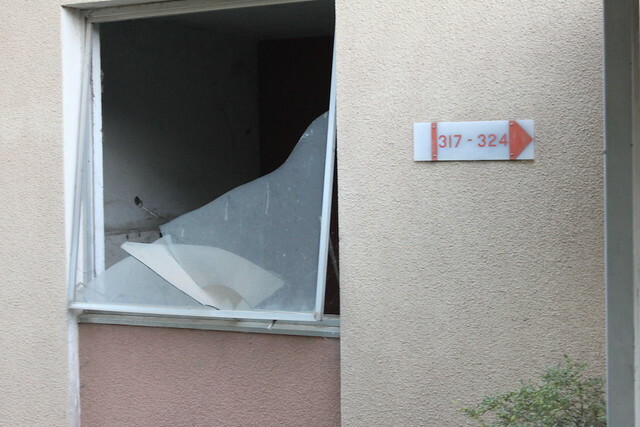 Insulation dripped from smashed ceilings, and spider’s webs screened broken windows. 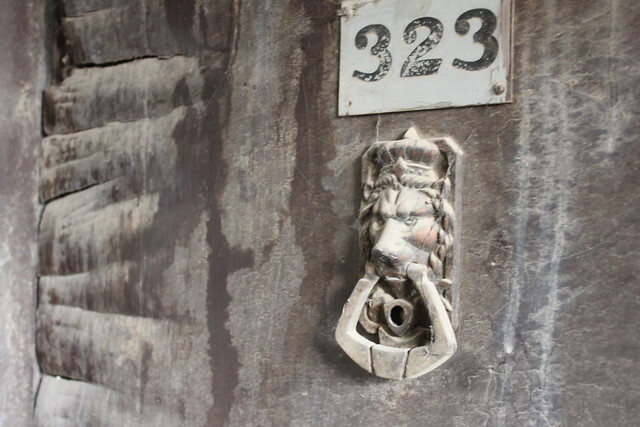 Of the 192 rooms in the hotel, only thirty-five are functioning, they tell me. I ask them to take me to a functioning room. Dirty mattresses hang off of old bedframes, the walls are stained. A light bulb dangles from a wire in the bathroom. “How much would this room be if I want to stay?” I asked. “N5000,” they tell me. “How long has the hotel been like this,” I ask? As they took me around the hotel, I could see that the place could be beautiful. The bones are all there. The garden is overgrown but alive. 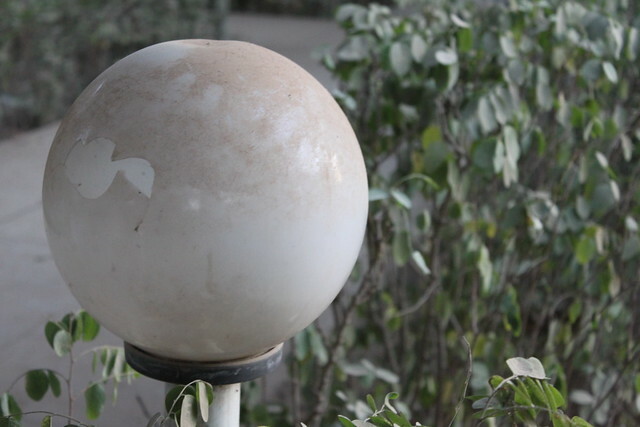 The fixtures, though broken, are attractive. 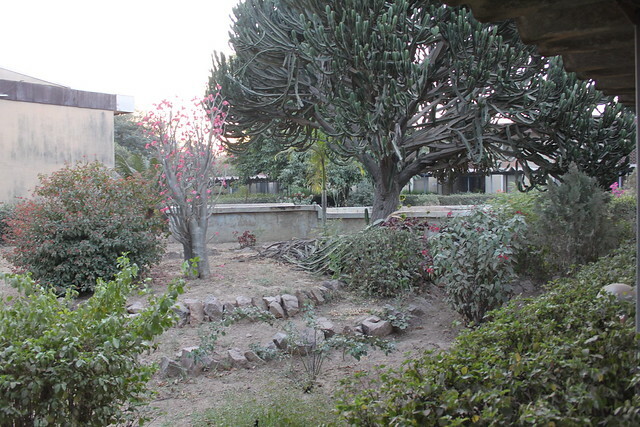 I could imagine it a pleasant place to stroll on a cool Kano evening. 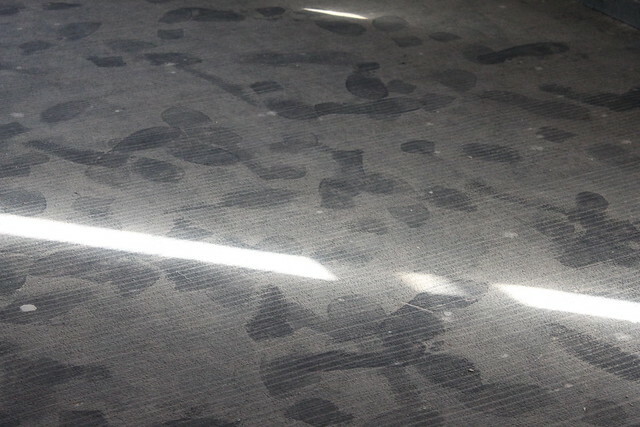 But, for now, with its layered over footprints and shattered glass and dusty lion fixtures, it reminds me of C.S. Lewis’s description in his fantasy novel The Magician’s Nephew of an abandoned planet where everyone has died. 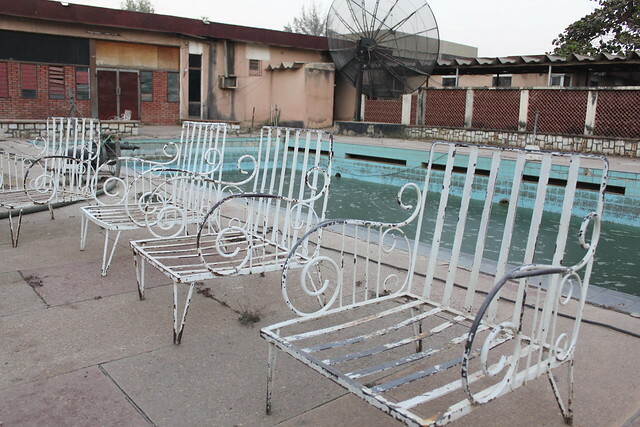 The pool at Daula has an apocalyptic feel about it, drained of water, lawnchairs scattered haphazardly, a random couch, backless with the stuffing coming out. Once they had taken me around to the pool, the workers thanked me and left me to make my way back out. The light had nearly gone by then, and the photos came out dull and gray. 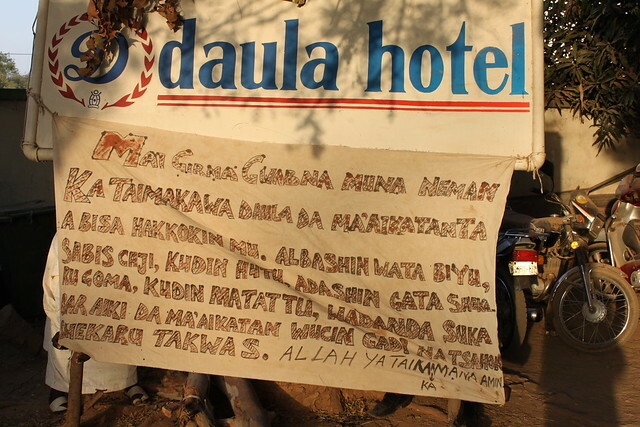 This entry was posted in Kano and tagged Daula Hotel, Kano, salaries not paid, strike. Bookmark the permalink. 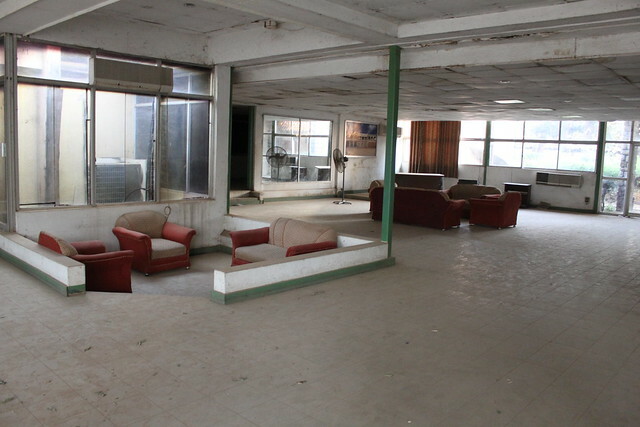 Wow, what a waste of such a beautiful space. I hope it can be brought back to its former glory. I grew up in Kano in the late 70s and can remember the Daula Hotel as it was and the many happy childhood memories made there, it saddens me to see it like this.